Space on my desk is precious real estate, only to be granted to the things that really need to be there: computer, planner, Post-It notes, a box of tissues, a mini-storage unit for clips and stickers, and a mug of pencils, pens and markers. I’m trying to keep my office neat. But I’ve added a perpetual calendar next to the Our Lady of Fatima figurine who stands by: Lisa Hendey’s new Catholic Mom’s Desk Calendar. Flipping to the correct date, I found my very favorite psalm waiting for me, along with a beautiful prayer by Lisa. As you can see from the photo above, the color scheme is a calming blue, tone-on-tone. I’ve chosen almost that exact shade for more than one room in my home. The serene colors invite the reader to slow down, quiet down, and enter into a moment of prayer. You don’t have to have a desk to display this prayer calendar. You could keep it on your nightstand, bureau, or even the kitchen counter (though I fear that if I tried that in my tiny kitchen, it would be splattered with marinara sauce in short order). I have plenty of calendars in my office. I display two months of the calendar at a time, because I need to see that much for work. I have a Google calendar on my computer. And I have a planner on my desk. But this calendar is different. It’s not part of yet another to-do list for my family, my household, or my job. This calendar reminds me that “only one thing is necessary,” as Jesus told St. Martha, and I need to embrace that. Here’s a sneak peek at January’s calendar entries! Note that this is a spiral-bound perpetual calendar, not a book as pictured below, but you can get a good look at what the beautiful pages look like. Each day begins with a quote from Scripture, a saint, a pope, or the Catechism, followed by a brief prayer related to that reading. Place this calendar where you’ll be sure to see it each day, and enter into a quiet moment of prayer in the midst of your busy life. Beginning today, it’s all adventure, all the time. Add up two part-time adventures and you get a full-time adventure! Later this week I’ll be traveling to Massachusetts to “meet the family” at Holy Cross Family Ministries and work on the details of bringing CatholicMom.com under their umbrella. There have been lots of emails and phone calls, and everyone has been very welcoming. I’ve already received a rough agenda for my 3-day trip. Each day’s schedule includes Rosary and Mass. That’s the kind of work schedule I can get behind. That kind of work schedule helps give me the support I need to do the work I do! And I officially start tomorrow, but I’ve been easing in to this a bit: I’m the new managing editor/digital content manager at Today’s Catholic Teacher magazine. I did this work on an interim basis for a month last summer, so I’ve had a taste of what I’ll be doing, but I’ve never worked through the whole process for an entire issue of the magazine. There’s plenty of support as I get to know the ins and outs of the job. My tiny desk in my tiny office. I need more space in my workspace! All of this means that my tiny desk in my tiny office isn’t enough anymore. I need room to spread out with notebooks and clipboards and bullet journal and laptop. For my birthday, my family took me to Ikea for a new desk. Before I can break out the Allen wrench and assemble my new furniture, though, we have to get an old twin bed out of the room. It’s taking up most of the space, and I’ve only got 9×10 to start with. This also means that I’m going to need to get serious about time management. I’ve begun working through the exercises in Katharine Grubb’s When the Timer Dings, because she has a realistic view of what it’s like to work from home and care for a family at the same time. For me, working from home is the only way I’d be able to work right now. I need the flexibility to be able to take care of TheKid when diabetes gets . . . interesting, even if that just means I’m working in the next room while keeping an eye on blood-sugar levels and delivering juice or sugar-free Gatorade, depending. It doesn’t happen often, but it’s never predictable, so availability is key. On Saturday I received a review copy of Busy Lives & Restless Souls, new from Ignatius Press. Today is the feast of St. Ignatius of Loyola; what better time to begin reading a book whose back cover promises, “Elderidge interprets principles of Ignatian spirituality in a fresh way to equip us with prayer tools that are accessible and practical within the relentless realities of our daily routines.” Yes–this book is for me. It’s time to get started on my new full-time adventure! My plate is full. My cup runneth over. It’s been a big week at work. First, the announcement that Holy Cross Family Ministries is welcoming CatholicMom.com as part of the family. I’m beyond grateful for the job I’ve had since March of 2015–I love the work that I get to do, and that it offers me the flexibility that my family circumstances require. I’m equally grateful that Holy Cross Family Ministries will be keeping me on to do this work. On the outside, things shouldn’t look too different. There may be some extra logos and links around as the various HCFM sites cross-promote each other. But nobody wants to change what makes CatholicMom.com special. It’s so special, in fact, that founder Lisa Hendey and I won an award this weekend; for the second year in a row, CatholicMom.com placed second in the “Best group blog” category of the Catholic Press Association awards! Our names are on the award, but without the 125+ contributing writers, CatholicMom.com wouldn’t be what it is today. On the inside, things will be different. That’s the part you can’t see. It’s not a bad thing; it’s just a different thing. There’s a whole team at HCFM that I’ll be working with. I’ve had a few emails from them and everyone is friendly and helpful and I think it will be easy to work with them. Eventually there will be someone who will be trained to do what I do, so there’s a backup plan in case of emergency or vacation. I’ll have to get used to people who like to conduct business via phone instead of email, Evernote or Slack. I’ve never talked so much on my cell phone since I’ve had it than I have in the past week or so! There are lots of people I need to meet and lots of details on lots of lists that we need to get figured out. It’s going to be a busy summer. I want to make sure that the transition is as seamless as possible for the many writers whose work I edit and for the readers who see it once it goes live on the website. In the meantime, if you need me, I’m probably hiding holed up in my office. And there’s a good chance that I’ve put M&Ms on the grocery list. For medicinal purposes. Image created at Recite.com. Copyright 2017 Barb Szyszkiewicz. All rights reserved. Just over 5 years ago, my first article was published at CatholicMom.com. Since that first “Tech Talk” June 12, 2012, I’ve written well over 500 articles for the website: mainly book reviews, Tech Talks, and recipes for the year-round Meatless Friday feature. In March of 2015, that volunteer opportunity turned into my dream job. It’s exciting to be able to work for one of my very favorite websites, and to be working WITH a veritable army of amazing contributing writers. I’ll still be doing a little writing for CatholicMom, but most of my work is behind-the-scenes. I’m like Stage Crew, but for the Internet: checking props, hauling scenery and signaling the director to bring up the lights and start the music. Best of all, I’m working from home, which means I can be available for Mom Duty at any time, I can get to daily Mass, and I don’t have to wear uncomfortable shoes. That’s a vocational WIN right there. I’m very grateful for the opportunity to be a stagehand for a website that’s been a big influence on my life for quite a few years. Yesterday, there was a big announcement at CatholicMom.com: it’s been welcomed into a big family at Holy Cross Family Ministries. Translation: more power for the website, a larger and possibly multilingual international audience, and the opportunity for me to continue doing what I do (within my own time zone, even–I’ve been living in Eastern Time and working in Pacific for over two years)! I’m grateful for the opportunity to write and work at CatholicMom.com, and I look forward to what the future will bring. I’m always happy to review children’s books. I may not be reading them along with (or ahead of) my kids anymore, but since I volunteer in the school library, I spend a few hours each week surrounded by children’s books and children asking for book recommendations. Jake Frost’s new picture book, The Happy Jar, is one I’ll definitely recommend to young readers, but I think it’s most effective as a read-aloud. What a wonderful bedtime-prayer ritual, and what a great story of the daddy-daughter bond. Then again, the bond between father and child is the signature topic for Jake Frost, and one he explores with great humor and tenderness. The illustrations in this book stand apart from many of the children’s books that are published today. While these illustrations are brightly-colored, they’re not garish or glaring. They’re simple and engaging, just right for a bedtime-story book. When you read The Happy Jar with your young child, you’ll be reminded that the best memories don’t have to cost a lot of money. Many of the best memories don’t cost any money: they’re just based on time spent together, having fun, letting children use their imaginations and enjoying the world around you. After you read The Happy Jar with your young child, ask what they would like to add to their “happy jar” that day. I know it’s early to be thinking about Father’s Day already, but this book is a perfect gift for a small child to give to Daddy on Father’s Day. I found Kate Wicker’s book on perfectionism, Getting Past Perfect (Ave Maria Press, 2017) to be a book of surprises, beginning with the fact that a “seasoned” mom like me, with kids age 15 to 25, can learn important lessons from a mom whose oldest child is younger than my youngest. I may be a more-experienced mom, but that really only means that I have logged a lot more years of falling into the comparison trap. I’m old enough to know that it’s not good for me (or for my family) but I’m not always strong enough to keep myself from teetering over that precarious edge. While I definitely agree with Kate’s premise that perfectionism is damaging to us as women and as mothers, I do believe that there’s also a danger in perfect imperfection. We need to be careful about crossing that line between openly admitting our own flaws and foibles in the name of commonality and bringing comfort to others who are stuck in that “grass is always greener” mode, and showing off how bad we have it (even if that’s our schtick.) I confess to being guilty of the latter and even though I tend to fall into that trap, I find it very annoying when all I hear from someone is how “crazy” her life is. It’s almost like we’re competing for the booby prize: who has it worst? We all need to find a balance here–there’s a time and a place for the good, the bad, and the funny. Whether you’re a brand-new mom or, like me, over 25 years into your mothering journey, Getting Past Perfect has truths you need to hear. My copy has stars and arrows and comments; I’ve circled and underlined and even written down some of the most important points. When you read it, keep your pen handy and open up your heart to realizing that you really are enough. 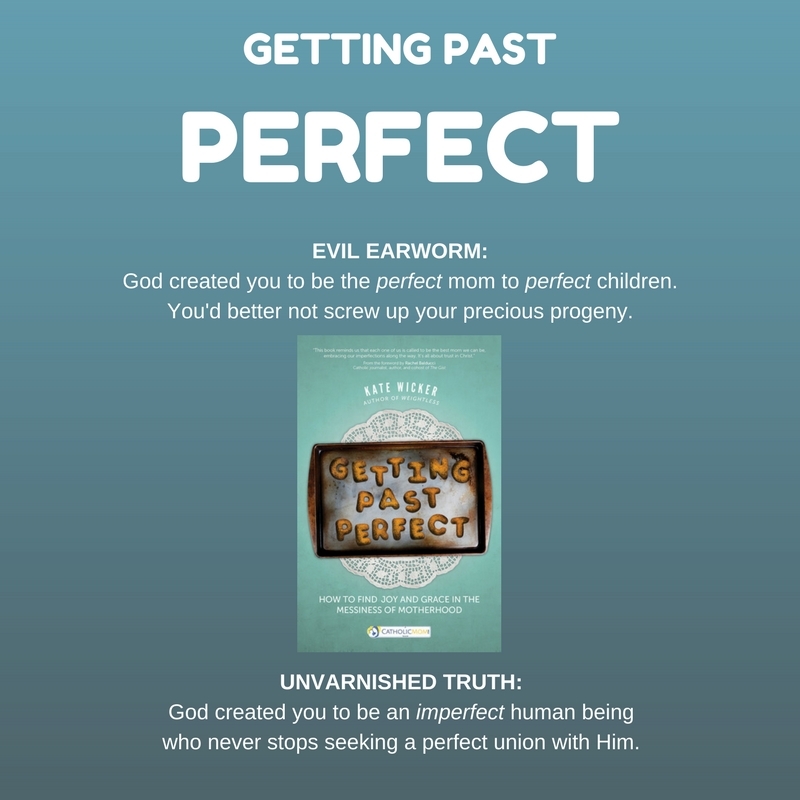 Don’t forget to sign up for the Getting Past Perfect Book Club at CatholicMom.com! The book club kicks off with an author interview tomorrow, and we’ll begin discussing the book on April 1. This post contains Amazon affiliate links; your purchase through these links helps support this blog. Thank you! I received a free review copy of this book courtesy of Ave Maria Press, but no other compensation. Opinions expressed here are mine alone. It’s the first Monday of the month, so I’ve gathered up links to the work I’ve done in other spaces. Tech Talk: Listen to Our Writers: Several CatholicMom.com authors have their own podcasts! Subscribe to their shows for encouragement, entertainment and education. Walnut Spice Cake: a dressed-up quick bread perfect for dessert. Mushroom-Rosemary Marinara: a hearty meatless pasta sauce. Orecchiette with Ricotta and Peas: comfort food! Cod with Mustard and Panko: a jazzed-up baked fish dinner. 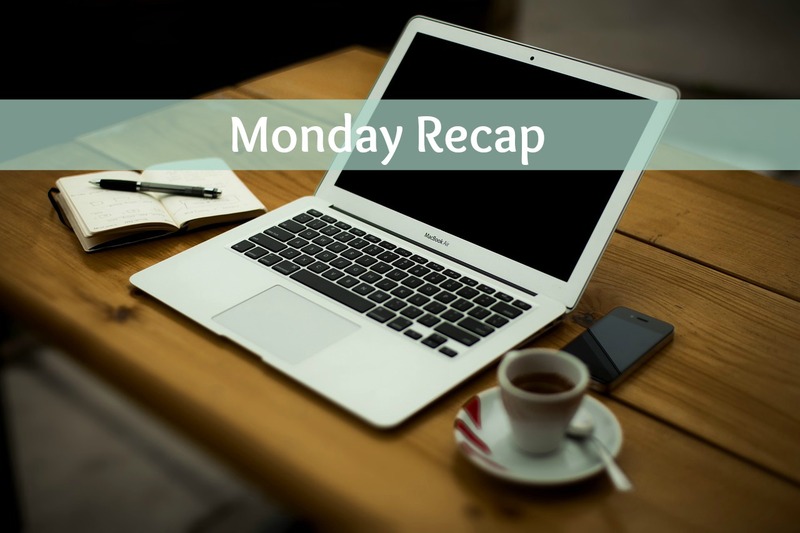 The beginning of November got away from me, so I’m including 2 months’ worth of articles in this edition of Monday Recap. It’s the first Monday of the month, so I’ve gathered up links to the work I’ve done in other spaces. A review of a different kind of coloring book: At Play in God’s Creation is an invitation to prayer and creativity. My review of Leslea Wahl’s novel for teens, “The Perfect Blindside,” featuring an unlikely couple who team up to solve a mystery and find something more. Faster and cheaper than takeout: I break down the veggie burrito bowl for your Meatless Friday dinner. Courtesy of Holy Spirit Radio. Catholic evangelist Gary Zimak launched a new morning radio program this week! Here are the details on how you can listen, no matter where you live. Rosa, Sola by Carmela Martino deals with the sensitive topic of infant loss and brings up questions about living out the Works of Mercy. I discuss the book with the author and interview key characters. YOU, a new Theology of the Body study program for teens from Ascension Press, that challenges and engages teens in the discussion of a difficult subject. My interview with teenage author Shane Cloonan about Journey to the Cross, a picture book for children that’s perfect for Advent and Christmas reading. Book Notes: Who Does He Say You Are? My review of Who Does He Say You Are? by Colleen C. Mitchell, a book inviting women to put themselves in the places of women in the Gospels. Here’s an easy way to dress up plain baked fish fillets with a 4-ingredient sauce. This dinner takes just minutes to make but looks and tastes fancy enough for company. My review of two guidebooks that will make great gifts for the young adults in your life, with tips on keeping the faith in college and finding a faithful spouse. My review of Carolyn Astfalk’s newest novel, Ornamental Graces, and interview with four of the novel’s supporting characters. I had a hard time putting down a new Advent devotional by Heidi Hess Saxton. Advent with Saint Teresa of Calcutta offers food for thought and prayer for any reader who is devoted to this fascinating saint. Capsule reviews of 6 biographies: no tell-alls here, but books that will inspire you in the spiritual life. How many ways can a Catholic pray? “Prayer in the Catholic Tradition” covers the history and how-tos of Catholic prayer. My review of Christopher Blunt’s Full Cycle was picked up by Midwest Review of Books. My review of 101 Tips for Marrying the Right Person was picked up by the Ruth Institute.